Dubai, UAE 20 January 2019: Airbus is showcasing its latest secure communications solutions at this year’s Intersec exhibition in Dubai, the world‘s leading trade fair for security, safety, and fire protection. These solutions are being used by security authorities to safeguard cities, ensure protection for citizens and residents, and respond to emergency incidents. As the leading provider of secure intelligence platforms, Airbus is demonstrating Virtual Reality applications that facilitate the work of paramedics or firefighters during their operations on the scene. These technologies enable field and control room officers to support fire fighters on ground when rescuing people. Also, camera simulations and drones can be integrated into this solution. In addition, Airbus is featuring the collaboration tool Tactilon Agnet 900 at the exhibition. This application for professional group communication allows efficient and secure exchange of information on Tetra radios and smartphones, to assist, for instance, police officers or healthcare teams. Also, the award-winning Tactilon Dabat, a Tetra radio and smartphone in one, will be on display at the booth. It received the ‘Innovative Security Product of the Year’ at Intersec Awards 2018 and the ‘Best evolution to future broadband’ category of the International Critical Communications Award 2018. Intersec 2019 is happening fron the January 20th to the 22nd, at the Dubai International Convention and Exhibition Centre. During the event, Airbus is displaying at the stand of Nedaa, the Dubai Government security networks provider. Visitors will find the stand at Sheikh Saeed Hall 3. The company is also demonstrating their revolutionary device’s man-sized version representing Tactilon Dabat. Dabat plays a crucial role in bridging the gap between secure narrowband and broadband networks. 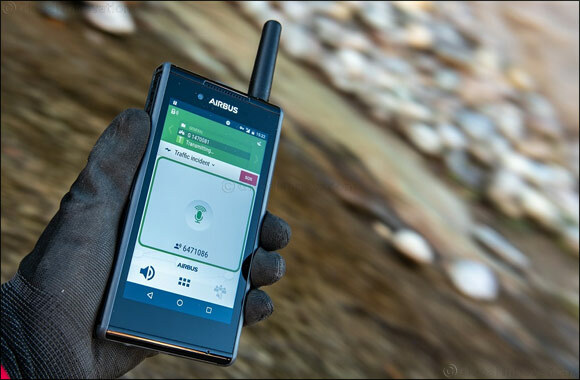 The world’s first integrated smartphone and full Tetra radio in one is designed to facilitate the work of police officers, paramedics, firefighters, and other industries. Selim Bouri said: “The solutions that we are introducing at Intersec are designed to help organizations operate in new and better ways. Our team of experts will be on hand to discuss critical roles of our innovative systems in saving lives and protecting properties during emergencies. During Intersec, Airbus is also hosting the winners of the recently concluded ‘Critical App Challenge,’ namely Steerpath (Finland) and Epic.blue (Belgium). They will be presenting their inventive digital solutions and how these will help ensure public safety and secure business operations.